The galaxy has an apparent magnitude of 10.5. It has the designation NGC 4579 in the New General Catalogue. 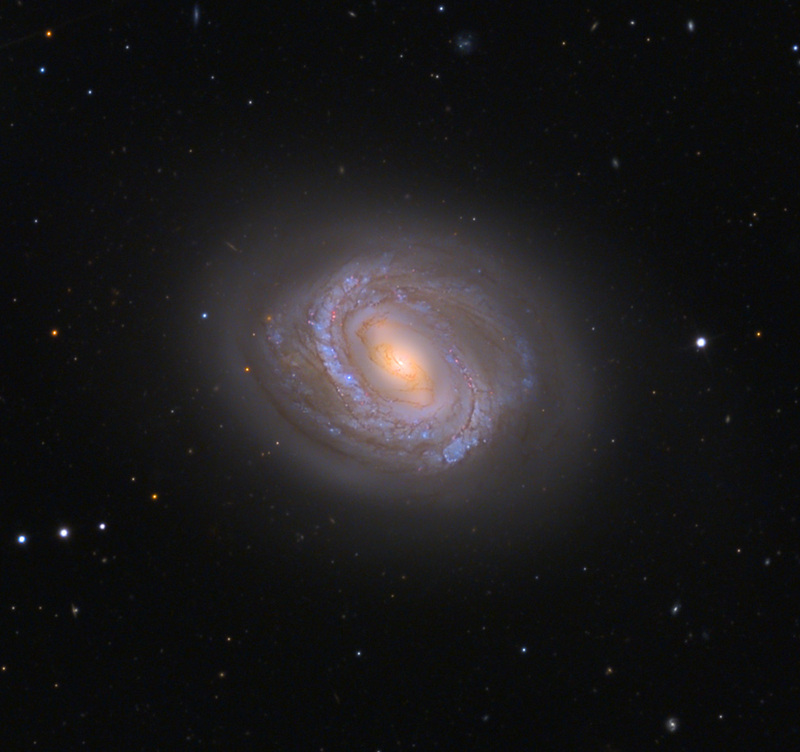 Messier 58 can be a challenge to find as it lies in the Virgo Cluster, an area with many galaxies, which makes it difficult to identify any single one. 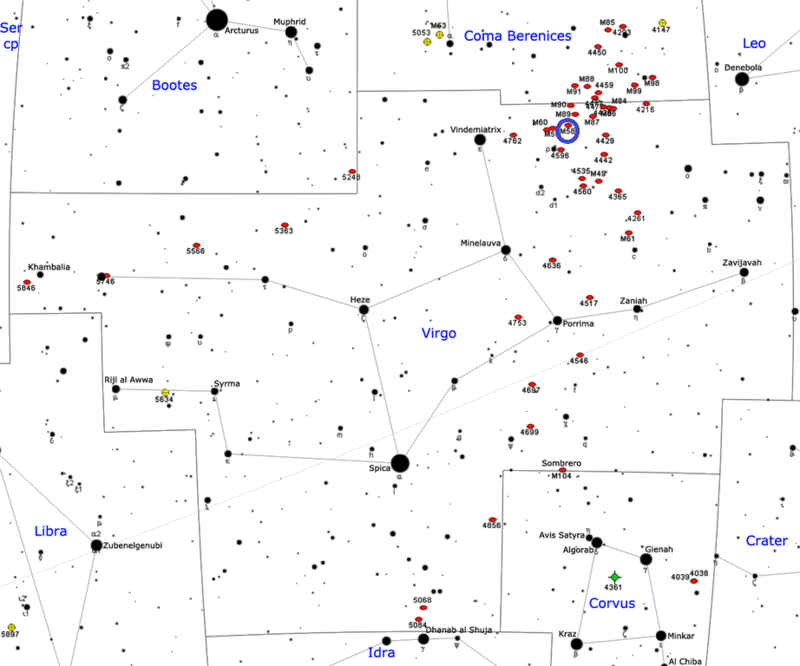 M58 can be located along the line from Vindemiatrix, Epsilon Virginis, to Denebola, Beta Leonis. About 4.5 degrees west and a bit north of Vindemiatrix lies the elliptical galaxy Messier 60. Messier 59, another bright elliptical, lies a bit further to the west. 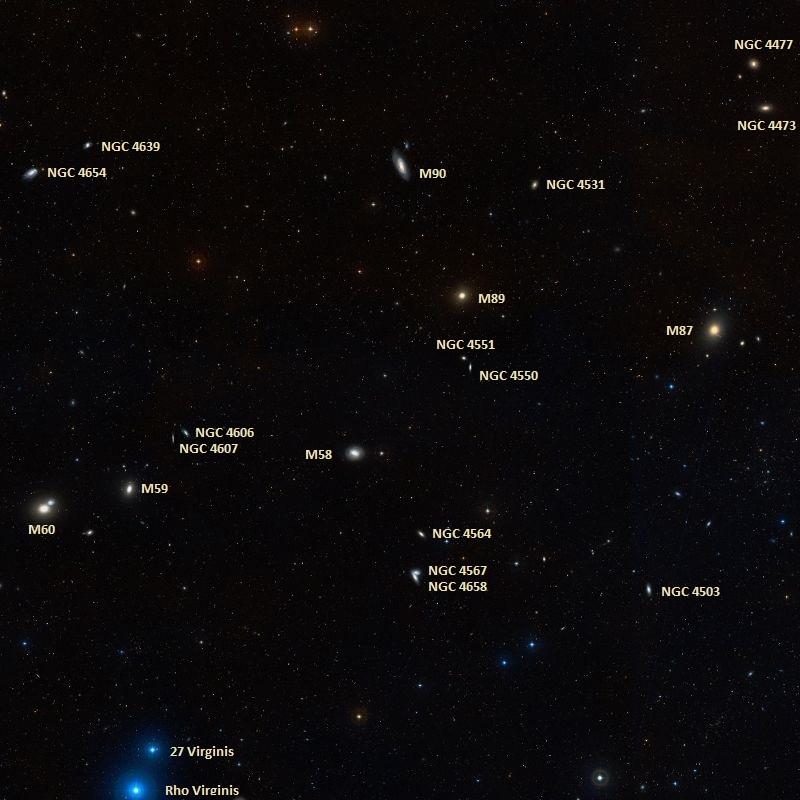 Messier 58 can be found yet another degree to the west, slightly south of the line connecting Vindemiatrix and Denebola. The galaxy is located only about 2 degrees away from Rho Virginis, a white main sequence star with a visual magnitude of 4.9. In spite of its distance, M58 can be seen in large binoculars. In small telescopes, which only reveal the galaxy’s bright centre, M58 appears similar to elliptical galaxies found in the Virgo Cluster. 4-inch and larger telescopes show the galaxy’s halo, while 8-inch telescopes reveal a hint of the galaxy’s bar. The best time of year to observe M58 is during the spring. Messier 58 is the most distant Messier object and one of the brightest members of the Virgo Cluster. It is an anemic galaxy, which is to say, a spiral galaxy with a low contrast between its disk and its spiral arms, very little neutral hydrogen gas, fewer H II regions, and a low star formation activity. The lack of hydrogen is believed to be a result of interactions with the Virgo intracluster medium (ICM), the superheated plasma at the centre of the Virgo Cluster of galaxies. The extremely high temperatures are caused by gravitational energy released within the cluster. The active galactic nucleus of M58 has a low luminosity. The galaxy’s core may have some starburst activity and is believed to contain a supermassive black hole with an estimated mass of about 70 million solar masses. 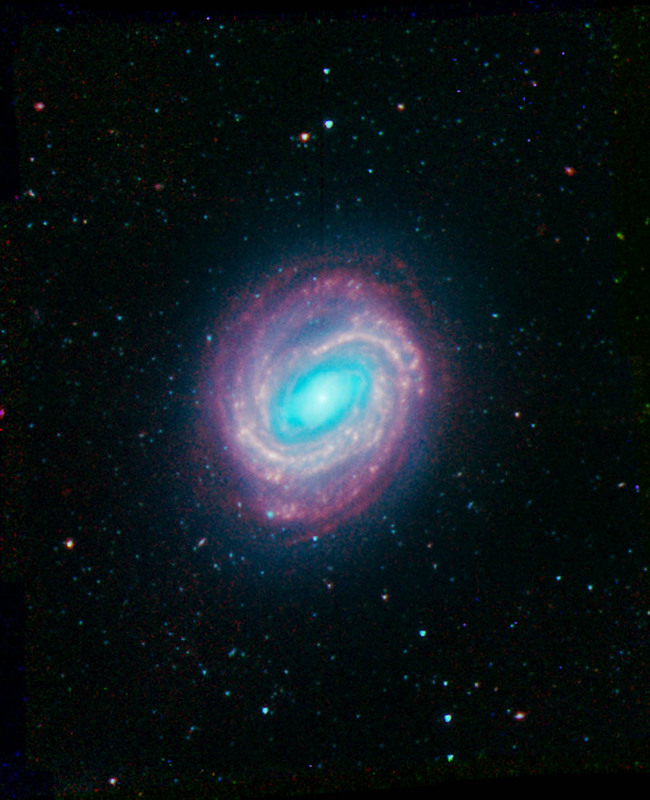 Messier 58 is one of the rare galaxies that have an Ultra-Compact Nuclear Ring (UCNR), which consists of multiple starburst regions found within a very small ring around the galaxy’s nucleus. Two supernovae have been detected in M58. SN 1988A, a type II supernova with a visual magnitude of 13.5, was discovered on January 18, 1988, and SN 1989M, classified as type I, was first spotted on June 28, 1989. It had an apparent magnitude of 12.2. Messier 58 lies near a pair of interacting galaxies, NGC 4567 and NGC 4568, known as the Siamese Twins or Butterfly Galaxies. The two spiral galaxies, also members of the Virgo Cluster, are located only about 30 arc minutes southwest of M58. John Herschel catalogued the object as h 1368, describing it as “very bright; irregularly round; gradually brighter toward the middle; a bright star precedes [lies to the West] 1/2 field.” He later added it to the General Catalogue as GC 3121. Messier 58 was one of the 14 “spiral nebulae” listed by Lord Rosse before 1850.